No matter how carefully you look after your fish, there will be times when they become ill or injured and there's nothing you can do to help them. Because taking an already stressed fish to the vet will cause a lot of trauma in itself, it's better if you can euthanase fish at home. This is something that many aquarists find very difficult. It's important to know how to approach it in the kindest way for your fish, and in a way you can cope with too. Deciding on the right time to kill an ailing fish can be hard. Sometimes fish are able to come back from very serious health problems. It's usually best to try a full course of medicinal treatment before you decide to euthanase your fish. You can use a complementary medicine such as Liquisil general tonic or melafix to reduce stress and discomfort at this stage - check the bottles to make sure medicines are safe to use together. Some types of fish disease are fatal and incurable. Your vet, or an ichthyology specialist, should be able to diagnose these by symptoms you describe without having to see the fish. Not all of these diseases, however, are painful to the fish. Individual fish react differently to them. If your fish is not in distress, it's up to you to decide if you want to commit yourself to the extra care it may need for its remaining days or months. If a fish's behaviour suggests that it is in a lot of pain or if it has a wound that simply isn't healing (wounded fins are not a problem unless there is bleeding right at the base), it's usually best to accept that it won't recover and that the best way to help it is to end its suffering. Unfortunately there are a lot of myths out there about how fish should be euthanased. Many people still believe that flushing a fish down the toilet will kill it quickly. This certainly presents the fishkeeper with a quick means of ending their responsibility, but it's a bad idea for the fish. Even very ill fish can often be temporarily revived by the acidity of water in the toilet, after which they will die slowly from multiple infections. 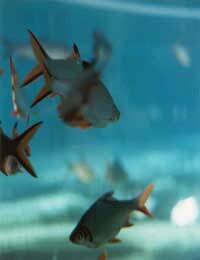 Some aquarists euthanase fish by feeding them to other fish big enough to swallow them whole. This almost certainly causes a quick death and it can be practical in a few situations, for instance with fish who are born severely disabled, but as a rule it should be avoided. Even fish whose suffering is caused by injury or non-contagious illness can have further opportunistic infections which could make your bigger fish ill in turn. Many people think that freezing a fish will cause it to fall asleep and die peacefully. Instead, the freezing process causes ice crystals to form within the fish's body, potentially causing excruciating pain. This is why it's important to know what you're doing before you act. When euthanasing fish as kindly as possible, there are two approaches to choose from. You can act quickly, so the fish has little time to take in what's happening, or slowly but more gently. Different people find different methods easier to cope with. The quickest way to kill a fish is simply to bang its head very hard by slamming it against a surface or banging it with a hard object. This may sound horrific, but death is almost instantaneous. It's important to act decisively to minimise stress, so this is not a method to use if you think you might hesitate. If you prefer to simply put your fish to sleep, the best chemical to use is 2-phenoxyethanol. This is used by vets as an anaesthetic for fish. It cannot be purchased on its own without a prescription, but it is available as the major constituent of Interpret's ant-fungus and finrot medicine. Because it's poisonous to humans as well as fish you should always be careful how you store it. To use this method, isolate the fish in a small container and add the medicine slowly. You shouldn't need much, but some fish, even of the same species, are much more resistant than others. Your fish should gradually become sleepy and its gill moments should slow down. The process can take up to forty minutes. When you can't see the gills move for at least two minutes, it's safe to conclude that the fish is dead. @Fisher - White spot is the most common disease in aquariums, but it is also one of the easiest to prevent by making sure the tank is free form contamination from the likes of rocks, plants and other objects.You will need to quarantine the new members for two weeks in an isolation tank, in order to check for symptoms and treat the others in your tank. With regards to the snails, while a few may be healthy, a lot could be damgaging in all sorts of ways. Your natural thought may be to rush to the pet shop and buy a chemical solution, but this can also cause problems for the fish. One natural way is to blanch a piece of lettuce in hot water then pop it into your tank at night which should draw the snails to it. Then it is a case of taking out the next morning snails included. But this isn't foolproof as it doesn't take into account the snail eggs. I suggest you speak directly to an expert in your local aquarium store in order to get some more advice. I hope this helps.